The hotel is probably in the best location of downtown San Diego. There are incredible views of either the downtown or of the bay and Coronodo island. I will always try to stay at the Marriot Marina when I am in downtown San Diego. You pay a healthy price for the room, then they charge you an extra $20.00 per night to park. Parking should always be included. It was a great stay and I would recommend to anyone and will be staying there again. The view was great, I was able to see the ocean and city. It was grit and I would go again. The cocktails and room service. Room wasn't ready when we got there. 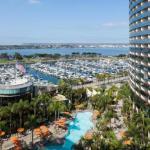 The San Diego Marriott Hotel & Marina is a fantastic choice for either a business or pleasure stay in Downtown San Diego. Located directly on San Diego Bay, next to Seaport Village, rooms have magnificent views of the Bay, Coronado, and the Coronado Bay Bridge. Conveniently located adjacent to the convention center and near the Gaslamp Quarter, San Diegos dining and entertainment district, and a short walk to Petco Park. A short cab or limo ride away from San Diego Airport. Along with the choices nearby, the hotel offers four restaurants and a lobby bar within. The rooms have luxurious bedding, high-speed Internet access, and all the amenities of a fine hotel. Amenities include two pools, whirlpools, a spa and fitness center, and the rooms contain all the items you need for a comfortable stay, including in-room coffee, cable TV and in-room movies. The spacious rooms view the San Diego Bay, facing either the Embarcadero and the ships, or the Coronado Bay Bridge or Coronado. With luxurious bedding, including down comforters and cotton-rich linens, the California Coastal theme rooms offer all the comforts for a weekend or extended stay. The rooms have high speed internet, cable TV, movies and coffee makers and a safe. The hotel has all you need to enjoy your time after the convention or before taking in the sights of San Diego. 2 magnificent pools and sundeck allow you to enjoy San Diegos sunny climate. Restaurants and bars are on the property, or close by in the Gaslamp Quarter and the renovated Petco Park area. Adjacent to a 446-slip marina, offering access to unlimited water sports and dockage rentals. The hotel has a spa and Fitness Center. Daily newspapers are included. Golf, boating and kayaking are nearby. Runners will especially enjoy the adjacent Embarcadero with great views and breezes from the Bay. An excellent choice for a stay in Downtown San Diego. Its location next to the convention center saves time and provides easy access to exciting dining and entertainment options nearby, including the Gaslamp Quarter and Seaport Village. The free-form pools and whirlpools are great, and the hotel takes full advantage of the view and sunny San Diego weather. The views of the Bay from the rooms are spectular. Upscale amenities include the spa and fitness center. The hotel is a premium property and is priced accordingly. High speed Internet is available for a fee, and parking rates are comparable to other options in the area.